Yuri Fomin was born in 1962. In 1979-1982 he was a studend at the Glier's Musical College in Kiev. From 1984 to 1987 - at the Gniesin's Musical College (Moscow) and in master-classes under the leadership of Kamill Frauchi and Alexander Frauchi . At 1991 Yuri graduated from the Institut of culture in Tashkent. 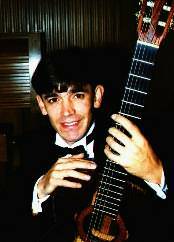 Since 1995 he presents guitar recitals in Ukraine, Russia, Germany. Yuri Fomin was participate at the numerous Festivals in Ukraine & Europa, regularly appear with numerous musicians. He is a member of Organum'99 & Bach-fest'99. Records on CD, radio, TV. "Yuri Fomin's play is very subtle and rich in variations and emotions. He fascinates the audience with his refined taste and openheartedness, measured interpretations, and a lively temperament. His skills are superb, his performing is splendid. ".